Our Thanks for 20 Years — Greenberg, Inc.
Greenberg Strategy celebrated our 20 year anniversary in October 2017. We chose the occasion to reflect on the opportunities we’ve been lucky to have, and the ideas we’ve seen over two decades in the heart of Silicon Valley. Our business didn’t begin in a garage, but it was close. Tired and frustrated by formal focus group facilities in vanilla downtown buildings, we designed a new research studio in Berkeley, California. It combined an industrial chic with the comfort and welcome of a good hotel. Our mission was to listen and to understand. Our belief was that creating the right environment was an essential precursor of a meaningful and authentic conversation. 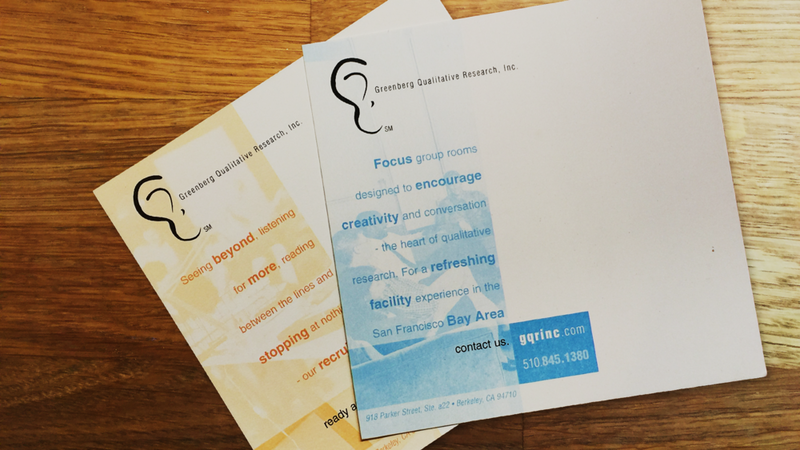 Greenberg marketing materials circa 1997. Our strategy work expanded with a growing crew of ex-agency planners, later joined by brand strategists, anthropologists, consultants and creatives. We celebrated our proximity to Napa and Sonoma with strategy work across many varietals, honed our gaming skills with Madden, and worked with a wide and ever-changing range of dot-com entrepreneurs as the economy crested in 2001. Technology continues to be at the heart of our work, with partnerships up and down Silicon Valley, along the West Coast, into Texas and beyond. Our HumanQuant® practice has innovated and expanded, as has our own creative studio with world class design and video. And our passion for that meaningful and authentic conversation, whether in Mumbai or Miami, continues to drive our qualitative work. As we enter our third decade, we're honored to collaborate with some of the world’s most amazing, valuable and innovative businesses. A huge thank you to everyone who has given us the opportunity to apply and extend our experience in pursuit of smarter answers and clearer patterns. And a deep thank you to the wider Greenberg team, in California, Boise, Denver, Philadelphia, Phoenix, Portland, Salt Lake City and Stockholm, who have made this work both possible and rewarding. We were excited to begin our 21st year by expanding into a beautiful new workshop and event space in our Emeryville, CA headquarters. We look forward to welcoming you here in the months and years ahead. New workshop and event space at our Emeryville headquarters. Published on October 11, 2017 by Gareth Walters.